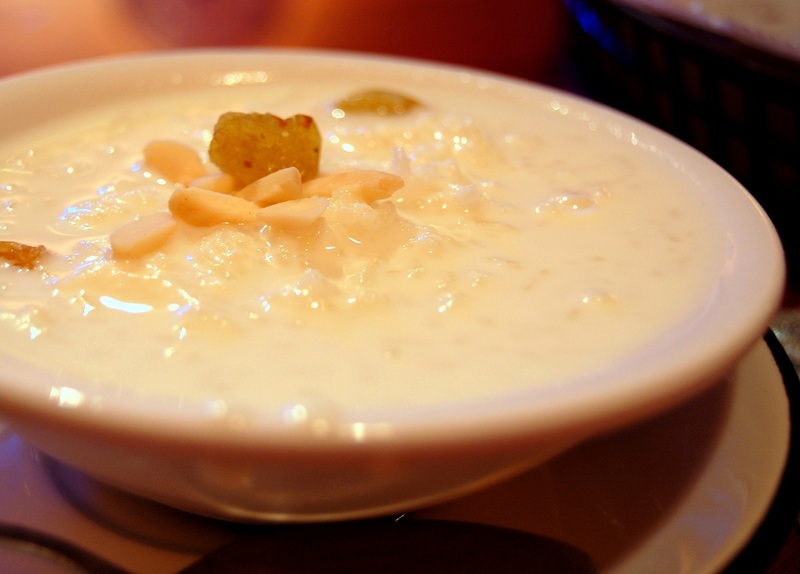 Phirni: Phirni is a South Asian rice pudding made by boiling rice, broken wheat, or vermicelli with milk and sugar; it is flavored with cardamom, raisins, saffron, cashew nuts, pistachios or almonds. It is typically served during a meal or as a dessert. It is an essential dish in many Hindu feasts and celebrations. It is also popular among Muslims for Islamic celebrations throughout India and Pakistan. Dry roast the saffron strands in a small pan for 10 seconds. Drain, wash and drain the rice again. Pat the soaked rice dry on an absorbent kitchen towel. Blend the rice in a mixer to a coarse powder. Mix 1/2 cup of cold milk with coarse rice powder to make a paste. Boil the rest of the milk in non-stick pan, on medium heat. Gently stir in the rice paste. Add in the sugar and saffron mixture. Pour the phirni into earthenware containers and keep aside to cool to room temperature. Phirni is ready to be served. Serve chilled garnished with almonds and raisins. If you have any queries regarding the Phirni recipe, please leave a comment.